Holy Dormition Monastery of Sviyazhsk is a monastery for men now on the island of Sviyazhsk, located at the confluence of the Volga and Sviyaga Rivers upstream from the city of Kazan, Tatarstan, Russia. The monastery was established in mid sixteenth century. It became a major institution associated with Christianity in the Diocese of Kazan. After being severely damaged during the Soviet time, restoration of the monastery and its dependency, the St. John the Forerunner Convent, has been in progress since 1997. Dormition Monastery was founded by the Archimandrite German (Sadyrev-Polevoy) in 1555 at the fortress of Sviyazhsk. Sviyazhsk was the base from which Ivan IV staged his final and successful assault on the khanate of Kazan in 1551. Arch. German was canonized in 1595. The monastery prospered as the adjacent town of Sviyazhsk became the chief town of the province as reflected in the name of the Diocese of Kazan and Sviyazhsk. While the initial economic significance of the town declined in the following years the religious importance of the monastery grew during the following centuries. By the mid eighteenth century the monastery was the most wealthy and influential in the Kazan diocese. During the years of Bolshevik rule, the monastery was closed and initially turned into a forced labor camp. Later, it was used as a detention camp for juvenile criminals. Subsequently, the monastery was used as a psycho-neurological clinic until 1993. 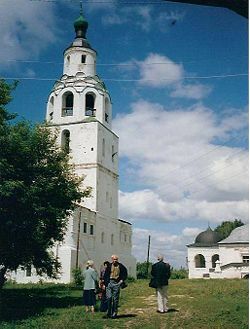 In 1997, the monastery property was returned to the Church of Russia. During the Soviet years, construction of a dam down stream on the Volga River formed the Kuybyshev reservoir. The reservoir raised the level of the river, drowning much of the low lying area around Sviyazhsk village. The flooding resulted in the formation of Sviyazhsk island in 1955 upon which the village and monastery are located. Upon the return of the monastery to the Church, Hegumen Kyrill (Korovin) was assigned as the first Superior. As the island and monastery complex have great historical as well as religious significance, restoration work on the island has pursued both restoration of the monastery and of the “Sviyazhsk” museum-reserve of history and architecture. From 1594 to 1598 - Abraham Palitsin, an ecclesia writer and political figure during the Time of Troubles. From 1738 to 1742 - Archimandrite Dimitri (Sechenov), later Metropolitan of Novgorod. From 1787 to 1787 - Archimandrite Platon (Lyubarsky), later Metropolitan of Astrakhan. From 1917 to 1918 - Bishop Amvrossy (Gudko), former vicar of the diocese of Vyatka and among the first martyrs of the Kazan diocese on July 27, 1918. He was glorified in 1999. The monastery consists of two parts, the Dormition Monastery itself and the dependency of the Convent of St John the Forerunner which is close by. The oldest church on the Dormition Monastery grounds is the Church of St. Nicholas. This church was built during the years 1555 and 1556 by a team of builders from Pskov led by Ivan Shyryay, The church was built out of limestone and includes the old cell used by St. German. A 138 foot (43 meters) high bell tower was built in the seventeenth century. Construction of the Cathedral of the Dormition of the Most Holy Theotokos was begun in 1556 and continued until 1560, also by the team of craftsmen from Pskov led by Postnik Yakov and Ivan Shyryay. A number of changes were made to the cathedral over the following centuries. In the seventeenth century the refectory was added to the cathedral. The original design of the cathedral used a cylindrical drum and helmet shaped dome. In the eighteenth century, this combination was replaced by an octahedronical drum and a cupola in the Ukrainian baroque style. A high porch was added to the refectory in the nineteenth century. 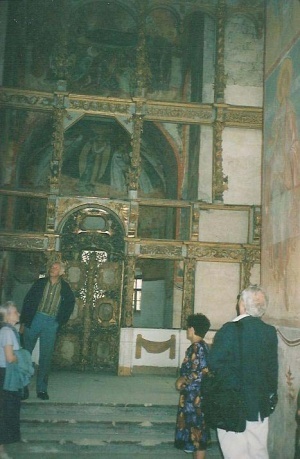 Among the features of the cathedral are the original murals that have been preserved. The frescos were restored during the 1890s through the efforts of the artisans N. M. Safonov, G. O. Chirikov, and Professor D. V. Ainalov. These frescos include portrayals of Tsar Ivan IV and Metr. Makary of Moscow. Restoration work on the cathedral continued from 1964 to 1984, and continues now after the Soviet period. Among the buildings of the monastery is the archimandrite’s residence that was built in the seventeenth century. The structure is a two storied building in the Russian tower chambered style. The residence was used by the Sviyazhsk Theological School from 1829 to 1858 before the school was moved to Kazan in 1859. On August 14, 2004, the Convent of St. John the Forerunner became a dependency of the the Dormition Monastery. The convent is located a short, walking distance from the Dormition Monastery. 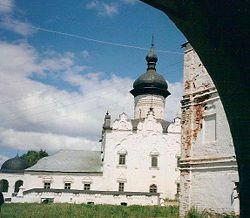 The convent was established late in the sixteenth century in the northwest part of the town of Sviyazhsk. After fires in 1753 and 1759, the convent, in 1764, moved nearer the Dormition monastery, to the abandoned buildings of the Monastery of the Holy Trinity and St. Sergius of Radonezh. This monastery had been founded in 1551, but was closed in 1764. On the grounds of the convent is the oldest church on the island, the small wooden Church of the Trinity. This church was brought by Ivan IV’s army as a prefabricated building to the Sviyazhsk fortress when it was established in 1551. During the intervening years the church has been re-constructed many times, but other than the original tent shaped dome that had been replaced by an onion shaped dome, the church has retained its initial features, . The Cathedral in honor of the Icon of the Mother of God “The Joy of All the Sorrowful” is the center piece of the convent. The cathedral was built over the turn of the nineteenth and twentieth centuries (1896 to 1906) to a design by F. D. Malinovsky. The cathedral is a large four pillared crucifix shaped temple in a neo-Byzantine style. The frescos were funded by the manufacturer Sergei Semyonovich Mechnikov. During the Soviet period the interior of the cathedral was desecrated, the icons were removed and the walls whitewashed, leaving only a shell of a church. The cathedral is now being restored. The St. Sergius Church, which dates from 1604, is named in honor of St. Sergius of Radonezh occupies part of the first floor of the refectory in the convent. The miracle-working icon of St. Sergius of Radonezh, that was kept in this church, is now kept at the Church of the Miracle-Workers of Yaroslavl in Kazan. This page was last edited on July 31, 2009, at 01:23.